Clinical nutritionist Jay Robb previously suffered from reactive hypoglycemia and developed the Fat Burning Diet as a means to stabilize his own blood sugar levels. 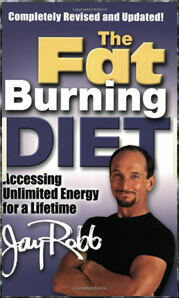 He claims he did not write it as a weight loss book but as a method to increase energy. Once the dieter’s energy levels increase any excess weight will be lost naturally without even trying he says. Robb explains that while low carb diets can produce fast results they can often leave dieters feeling tired and in the long run are associated with certain health risks. His solution is to advise dieters to cycle between high carb and low carb days. Each day he recommends three meals. Once a week dieters have a free meal where they can eat whatever they want but only for one hour. The diet is based on the concept of making the body burn fat as it’s primary energy source. Robb explains that alternating low and high carb days manipulates glycogen metabolism and this tricks the body so that fat doesn’t get stored. Robb also gives twelve different variations on the structure of the diet that are designed to suit a range of specific goals. Robb provides dieters with advice on how to select foods that are sources of good carbohydrates. He says that the wrong carbs are a major cause of fatigue and can produce sleepiness after a meal. Recommended carbohydrate foods include sweet and white potatoes, brown rice, pasta, corn, whole wheat bread and fruit. He also emphasizes the importance of high quality protein and healthy fats. Supplying protein in each meal is the key to keeping the blood glucose levels stable and will result in a constant supply of energy throughout the day. Look for other low carb and high carb recipes here. Robb recommends walking and weight training to increase muscle strength and metabolism however he makes the point that dietary changes are the most important factor for those who wish to lose weight. Try these resistance exercises along with the Fat Burning Diet. The Fat Burning Diet retails for $12.95. Good for people who don’t want to give up carbs but still would like the benefits of a low carb diet. Can help reduce food cravings and addiction to carbohydrates. May assist with the management of hypoglycemia and other blood glucose imbalances. Once a week ‘cheat meal’ can help reduce the stress of dieting continually and may increase the ability to stick with the diet. Carb and calorie cycling can keep the metabolism running smoothly. Can be adapted to suit vegetarians. Emphasizes high quality nutritious foods. Fairly restrictive plan especially on low carb days. May require more expense and time spent on food preparation as no processed foods are allowed. Robb includes religious references in his book that may be disagreeable to non-Christian readers. This diet will take a certain degree of discipline to maintain but for dieters who are committed it may provide a solution for the reduction in energy levels and metabolism that can occur with low carb diets. It is especially recommended for dieters who have trouble sticking to low carbohydrate diets but also do not achieve results on standard dietary approaches. Allowing dieters to eat carbs every other day has psychological and physiological benefits that may increase the likelihood of success. Robb, J. (1994). The Fat Burning Diet. Hi!am from kenya.I have a wife who ignores me once i starts talking to her about what kind of food to prepair for me.she like to prepair high cholesterol food but ignores advise on obesity.Iam now growing fat and iam confused on what to do next.Please help me on how to loose weight as fast as possible.Your help will be highly appreciated. Liz keep eating every 2.5-3 hours. Your doctor is correct. You may crash by restricting yourself to 3 meals a day. Any bodybuilder who feels better going from 5-7 meals a day down to 3 meals a day may have been doing something wrong. This did not give me the respected results at all. I followed it very closely but it left me feeling hungry and bloated. i am living in Jamaica but i see where you are helping alot of people with your program. There are a lot of people living here like my self need people like you to help us out here. This is an excellent diet…You can eat more than three meals per day…you have snacks and of course Jay Robbs protein. When you eat clean foods closer to nature you will be able to eat until full and feel full for hours. Humans must eat every two to two and a half hours. This is not only healthy (so ling as you eat small amounts only) but also increases your metabolistic rate! Three meals a day is not recommended. Three MAJOR meals sure but u need to have the invetweebs too! I think that if you are going to list the “religious reference” as a CON for non-believers, you should also list it as a PRO for believers! Just the fact that you mentioned it had religious reference made me more interested. Way to go Mr. Robb! I know the book does not make any big claims about lowering blood pressure, but that is what happened for me after going on this diet. I went from 148/98 to 120/70 in just 3 months, plus the loss of about 25 lbs of excess weight. I feel better, and I do not need blood pressure medication, which every one knows, makes its victims tired. I am not as hungry or as often as I was before I cut out all the sugar and grains, and I did not eat much sugar as it was. In response to Liz, I do not “crash”, I just don’t get as hungry. I have had a history of hypoglycemia and low energy. I also found it hard to lose that last twenty pounds. Like others, I had some success on other diets, but would eventually plateau. I would keep trying various new suggestions and would just keep confusing myself as to why I seemed to be stuck. With Jay’s plan, the weight loss was immediate and consistent. I also leveled my blood glucose levels for the first time in years. I really was effortless and following the diet was not hard at all. I am like everyone, skeptical. But I’m telling you it was the only thing that worked for me when nothing else seemed to. Oh, and in case you are wondering, I didn’t exercise at all. Jay doesn’t discourage exercise, but explains that a change in diet is much more effective in dropping body fat. I am a personal trainer and have been body building for many years. I have consistently followed a very strict, clean eating diet of eating 5-6 meals a day. Even after working with nutritionists and trainers, I had never been able to get the last few pounds off to show off my hard earned muscle. I started the Fat Burning Diet Made Easy a couple of weeks ago. It is incredible! I am NOT HUNGRY and very thankful that I no longer have to worry about getting those extra meals in. I have hypoglycemia and have had absolutely no problems so far with this way of eating. I have incredible amounts of energy and have yet to have any kind of “crash” from lack of food. I am getting very lean, very quickly and have never felt better. For me personally, this diet is very liberating as opposed to the 5-6 meals a day. I also find it very easy to eat out on this plan since you are allowed good fats. No more fretting as to whether the chef put butter in the pan. If you have tried all the diets out there and are still struggling, I say give this a shot. I think that you will be very pleasantly surprised, as I was. It goes against everything that I have been doing and everything that I have been taught as a personal trainer, but it works and works WELL. Personally, I will not go back to the 5-6 meals a day. This has become a way of life for me already. I only wish I had started this years ago. i really want to loose weight, so i have been running and lifting wieghts every day. I have also been eating less, but i am still the sam weight i was a week ago. what went wronge? Liz eat every 2 hours small portion meals called mini meals and drink at least 8 cups of water a day not tap water (too much chlorine and floride) you need purified water Kangen or Brita water just don’t use reverse osmosis as this has no minerals in it. I’ve lost 40lbs in 6weeks and drank 10 cups of Kangen water daily, 1 oz of water per pound. eating small meals speeds up metabolism. Try 6 week body makeover by Michael Thurmond on shopping channel. am confused because my doctor told me that I am supposed to eat every 2 1/2 – 3 hours but I want to lose weight. How am I supposed to only eat 3 meals and not crash? I am confused because my doctor told me that I am supposed to eat every 2 1/2 – 3 hours but I want to lose weight. How am I supposed to only eat 3 meals and not crash?